Home / GST-Tally / TallyERP.9 Lessons / How to Update Stock Item and Stock Group for GST Compliance? How to Update Stock Item and Stock Group for GST Compliance? 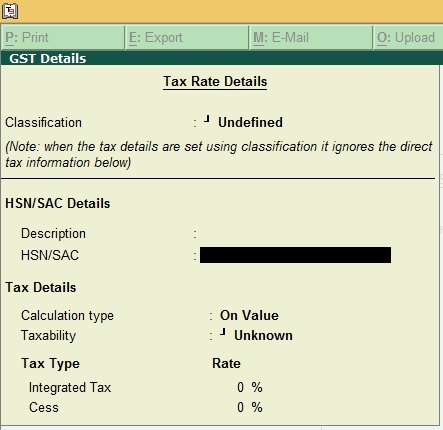 Stock Configuration is a major part to integrate GST in Tally. Without Stock Item or Group setup you can't get benefit of GST Compliances in Tally. So If you sold an item with different tax rates, update your stock item master or stock groups with the applicable GST Rates and the type of supply as applicable. In case you need different Tax Rates for different items, modify the stock item to include the applicable tax rates as applicable under GST Act. Enter details required in above screen. Select Taxability is to Taxable, Integrated Tax as per your norms (Suppose if your tax rate is 18% then it will be divided 9% each between Central and State Tax). Enter Cess if applicable. Press Enter to Save. Now Select the Type of Supply whether it is Goods or Services. Press Enter or Ctrl + A to Save. After enter the details Press Enter or Ctrl + A to Save. 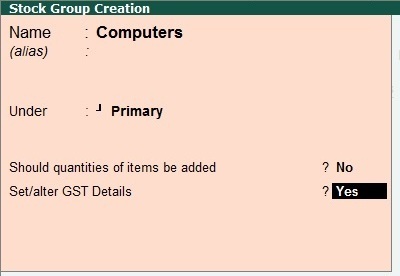 Your stock Item & Stock Group is fully configured for GST compliances.